The Professional Watercolour Sable brush range has been created using Winsor & Newton's unique brush-making expertise and feedback from professional watercolour artists. 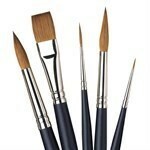 The brushes are hand-made with high-quality Kolinsky sable hair, Birchwood handles and seamless nickel ferrules. The range includes the most popular and useful brush shapes for watercolour painting and each brush has a unique sculpted handle with a matte finish for the ultimate in comfort.